Delaying Mario Kart 64 couldn’t have been an easy decision. Much had been made of the Nintendo 64’s four controller ports, one-upping (or rather, two-upping) the upstart Playstation and ensuring that games like Bomberman and Worms could be played the way nature intended. By sacrificing team members to the timely completion of Super Mario 64, Nintendo were leaving themselves without a title that supported multiplayer of any kind, least of all their promised utopia of four friends battling for supremacy. Launching in Japan in late 1996, it became apparent that the game – which had once been obliquely dubbed “Super Mario Kart R” – may have lost its SNES prefix, but the gameplay was an evolution, rather than a reinvention, of a title that had overcome critical indifference and become an enduring classic. Nips and tucks had been made: coins were the most notable casualty, though few lamented their passing. Additionally, the game’s four-tiered driver stats had been reduced to three, inadvertently ensuring that arguments over who got to play as Toad would last for the rest of the console generation. 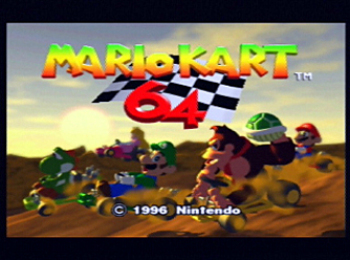 Mario Kart 64’s title screen would change as players completed objectives, but most content was available to dive into right away. It was to be two under-sold mechanics that would go onto define not just the Mario Kart franchise but also shape the wealth of copycat karting games to come. In this new edition, pushing a power-slide to the very brink of catastrophe and then slamming the analogue stick in the other direction would see your smoke trails turn from white to orange, netting you a handy burst of speed when you exited the turn. While the intricacies of drift-boosting would change in the games to come, here was an implementation that allowed skillful players to boost several times around even the gentlest of bends, opening up a whole new level of depth. Slipstreaming, while curiously redundant in a game so heavily weighted towards dragging your items as shields, was also introduced in Mario Kart 64 and has made a number of reappearances (to much better effect) since then. While there were relatively few new items considering the imagination that the Mario series has always been famous for, the headliner of Mario Kart 64‘s arsenal became one of its most notorious. The blue shell would zoom around the circuit at high speed, blatting aside anyone unlucky enough to get in its way before seeking out the first-place player and exploding in a ball of polygonal fire. Gifted surprisingly rarely considering the reputation they’ve come to earn, the blue shell was either a canny way of levelling the playing field between players of different skills, or a punishment for doing well and the downfall of Western civilisation – a view that normally depended on whether you’d just been on the receiving end. “Fake” Item Blocks made their first appearance, and were far harder to distinguish than in future installments. The blue shell was also one of the few weapons that could push past the stockpile of goodies players built up as they raced. Not only could single items be tugged along behind your kart to absorb the impact of an attack, but shells now came in orbiting packs of three, meaning that just brushing your opponent could be enough to send them tumbling. Seeing players armed with six red shells wasn’t uncommon, a frustrating arsenal that would later become the special weapon of just two characters in Mario Kart: Double Dash. Weapons were retained during collisions, which led to protracted exchanges of fire between human players and should have been enough to see off the CPU opposition… were it not for one of Mario Kart 64‘s most divisive decisions. While the running order was no longer determined by the player’s own character, certain drivers would once again be picked out to act as the player’s rivals. Unlike Super Mario Kart, however, these opponents were artificially and continually placed to snap at the player’s heels – a mechanic usually referred to as “rubberbanding”. These rivals would buzz around your character so closely that they’d inevitably crash into, and deduct from, your defensive items over and over again, spinning out of sight only to return unscathed a moment later at speeds any human would find impossible. While rubberbanding in racing games was not uncommon – some claimed it provided an action-packed race regardless of your skill level – the approach had become increasingly criticised as control systems gained the fidelity to emulate the skill of real driving. Even on 50cc settings, being jostled and harassed often diminished any sense that the player was improving, as well as making attacks seem powerless and feats of skill unimportant. It was also a decision that could wreak havoc in a two-player Grand Prix; a trailing human player would get caught up in the rabble trying to fight past particularly aggressive AI for a stab at first place. Sadly, it would be a dilemma Nintendo would continue to struggle with in years to come. 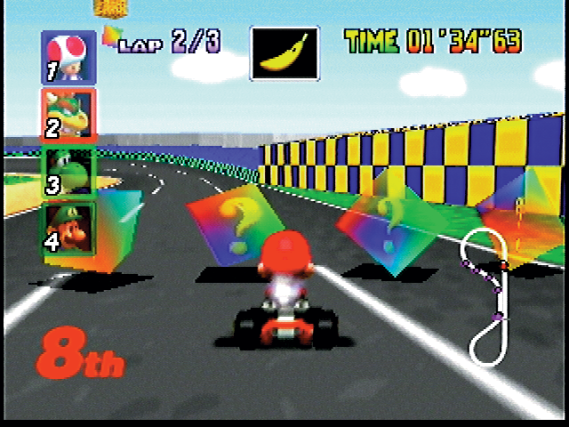 In a series renowned for its visual polish and art direction, Mario Kart 64 contained a number of interesting quirks and oddities, some of which showed Nintendo’s experimental design process at work. For one, the game had three completely different HUDs that the player could switch between at any time; the (now standard) Player List & Map combo, an all-but-useless speedometer and an abstract representation of each player’s relative position. Additionally, player actions were overlaid with bizarre onomatopoeia, with “Boing!”, “WHIRRR” and (a personal favourite) “Poomp!” accompanying hops and impacts. Coming so soon after Mario 64, seeing Peach’s Castle tucked away as an afterthought was an impressive display of horsepower. Other unusual features included the ability to dynamically adjust the music volume, a feature mapped awkwardly to the L button and therefore barely accessible during normal play unless the player owned a friendly octopus. Equally redundant was a single control meant to move the camera further back from your kart – but since the player effectively was the camera, all this did was rapidly (and nauseatingly) fiddle with the field of view. The rear-view mirror, sadly, did not make a reappearance. Looking back, it’s clear that Nintendo were determined to use every last polygon to explore a wide variety of terrain for their track designs. While the environments themselves stuck to familiar motifs, the diversity of their layout and how they made use of “true” 3D was impressive. Unfortunately, with so many ideas on display, it was perhaps inevitable that some would fare better than others. Highlights included the bumpy, Motocross-inspired terrain of Wario Stadium and the almost SNES-flattened ground and right-angled turns of Bowser’s Castle, while Yoshi Valley (a tangled maze of intersecting routes) simply didn’t work. One route was demonstrably fastest, so experienced players would sail onto the second half of the course (an inexplicably barren meadow) leaving newcomers confounded and annoyed. Equally infuriating were the courses that set you back a full minute for taking a hit mid-jump, or ones that delighted in simply blocking the way ahead with a train or giant egg. It culminated with DK’s Jungle Parkway, a track which sped its racers across a huge gap only to leave them facing in the wrong direction, necessitating an awkward about-turn from each and every player. The game’s soundtrack was consistently enjoyable, at least, with first-time composer Kenta Nagata contributing several themes that would go on to become series staples. Much like its forebearer, Mario Kart 64 relied on its multiplayer to make the most of what were, at its core, still inherently fun and compelling gameplay mechanics. 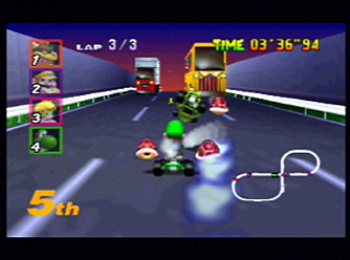 The N64’s first four-player game required a few technical sacrifices – there was no music, and the lack of a frame rate lock meant that some tracks ran at almost twice the normal speed – but the battle mode in particular benefitted greatly from a 3D overhaul. The most successful courses were those that were practically shooter-like in their construction, allowing for multi-level assaults and quick escapes. Toad’s Turnpike made good use of 3D, squeezing players between looming vehicles that could change lanes on a whim and send you tumbling. While battle mode remained a highlight, it didn’t have the lasting impact of its ancestor. 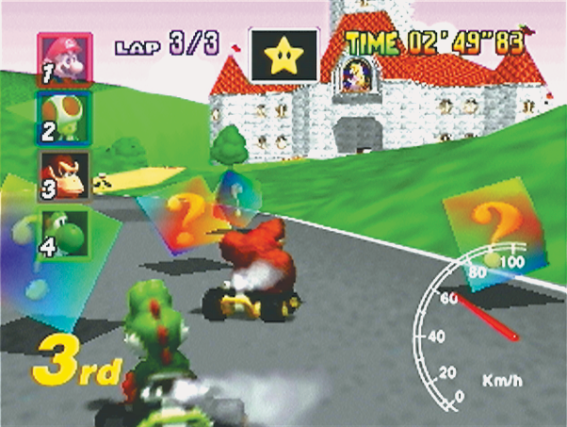 Super Mario Kart remained something of an oddity within the SNES library, which meant that battle mode did too, but the youthful N64 would soon offer many ways to step out of the go-kart and hunt your friends down in first-person, all of which challenged Mario Kart for the multiplayer throne. In years to come, the console would also see more technically accomplished racing games attempt to topple the series – usually substituting in hot property like the newly born South Park in their efforts to do so. Yet despite the suddenly crowded playing field, Mario Kart 64 was once again a sales success – and this time, the critics were on-board. While the game received a solid string of 8s and 9s from the press, it was noted that compared to the N64’s launch titles – games Mario Kart 64 had once been planned to sit alongside – there was little evidence of radical thinking. While Super Mario 64 had just redefined the platformer and Pilotwings 64 had taken full advantage of all that 3D space could offer, Mario Kart 64 had done little more than (as one critic put it) “soup-up” the original without addressing some of its fundamental problems. Yet for all its faults, the game laid the groundwork for modern Mario Kart titles – not for nothing did other companies chase its popularity and charm well into the dying days of the N64. Rough and ready in parts, gloriously future-thinking in others and sometimes just plain baffling, Mario Kart 64 did a lot with a little – for better or worse – and set the series on a course that would remain largely unaltered for the next eighteen years.